And really, having a simple chocolate cake in your arsenal for last minute cravings is essential. Especially one you can do in your cast iron skillet. Seriously, any pan you can both fry bacon and bake a cake in is tops on my kitchen-essentials list. And after the weekend that I’ve had (our AC fizzled out on a 93 degree day) a slice of chocolaty cake is the only remedy. Eat your pain people. It’s ok. I started with a little cocoa powder. Since I was having such a stinky day I broke out the fancy stuff. 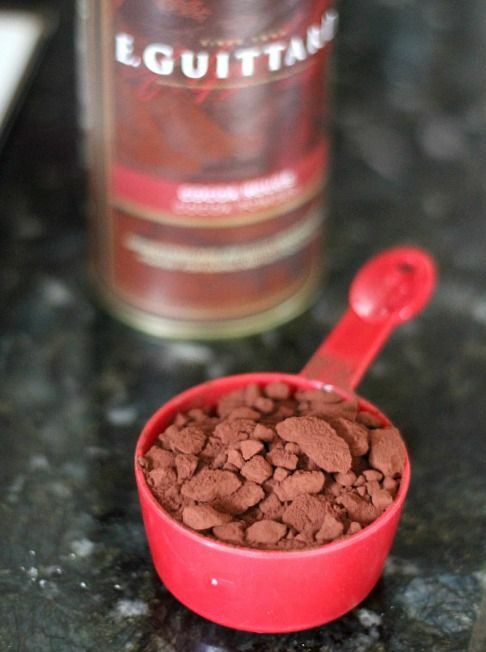 But certainly use whatever cocoa powder you have…I will say, though, that a dark cocoa powder is best for this cake. Spread your batter into a prepared skillet. You don’t HAVE to use a skillet for this recipe, but it’s kinda fun and leaves the edges of the cake slightly crispy, which I love. Then you should definitely frost it. I used my new favorite Fluffy Chocolate Buttercream. 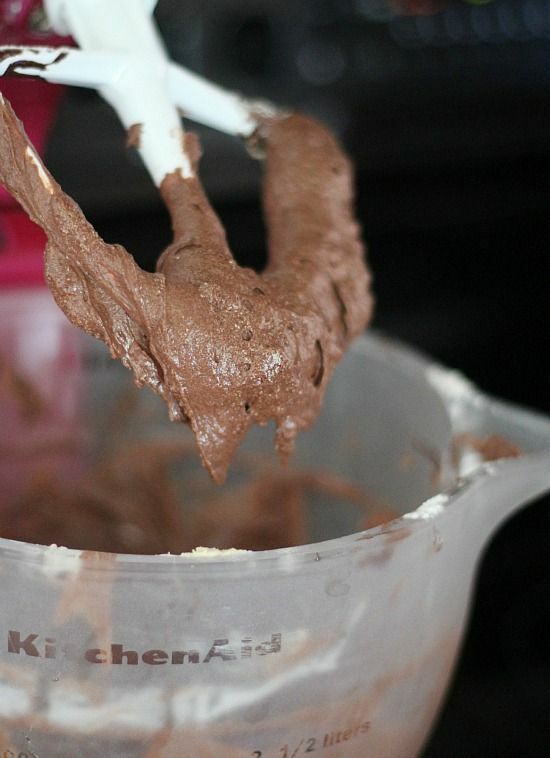 But if you’re trying to throw this together last minute, you can easily whip up my favorite Chocolate Fudge Frosting! The cake is slightly dense, perfect for any chocolate lover. ME! Grease 10″ skillet with butter. Line bottom of pan with parchment paper, grease again and dust lightly with flour. Set aside. 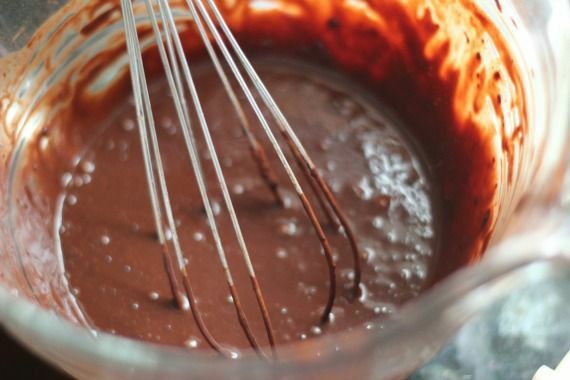 In medium bowl whisk together cocoa powder and chocolate chips. Pour hot water over top, let sit for 1 minute and then whisk until smooth. Set aside to cool. 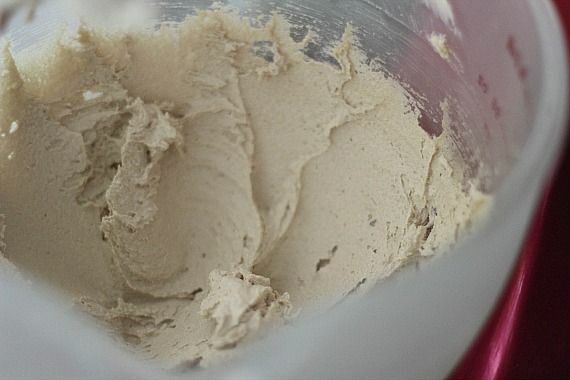 In another bowl whisk together flour, baking soda and salt. Set aside. In bowl of stand mixer, beat together butter and light brown sugar until light and fluffy, about 3 minutes. Add in eggs and vanilla beating until combined and smooth. 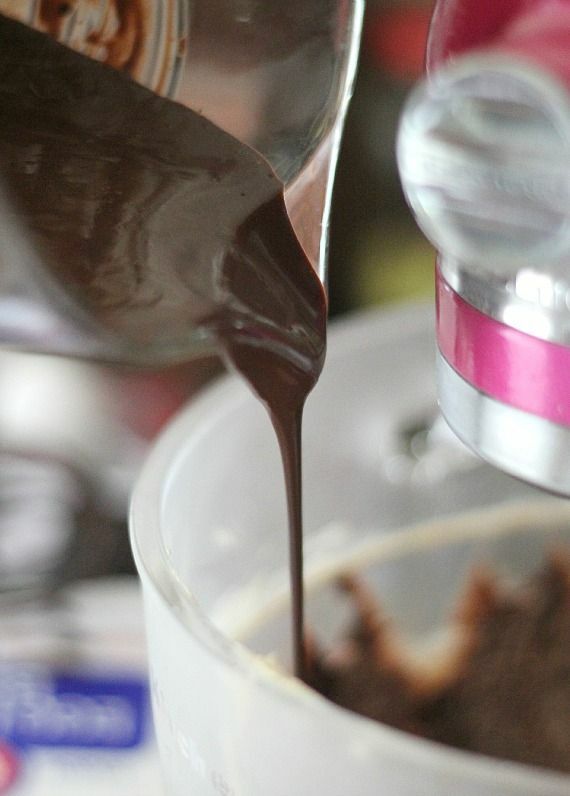 Turn mixer to low and pour in melted chocolate mixture slowly until incorporated. Finally add the flour mixture and buttermilk in alternating portions, beginning and ending with flour. Stir until just combined, scraping sides when necessary. Bake for 40 minutes, turning skillet halfway through baking. But cake with crispy edges certainly makes everything better. I love the sound of this! Cake in a skillet is genius and looks delicious! Man, 93! That sound pretty nice to me! I need some heat in my life! Sorry about your A/c though, that does stink! I have never made a skillet cake, but oh my gosh your looks delicious! Moist and those crispy edges! Whoa, I want a slice! As if you made cake in a skillet!! SO awesome. Love this! My A/C crapped out on me too. Really stinks, especially since I had to make multiple desserts for a family gathering but no way was I turning on the oven. One of the desserts I made was Blueberry Clusters. Make little clusters of well washed and dried blueberries on parchment paper (maybe 5 or 6 depending on size of berries), cover with melted dark chocolate. Let them set up. That’s it. Can’t wait to try this cake though when my A/C is fixed! Chocolate cakes are NECESSARY for happiness. That is all. I have seen so many skillet cakes lately but I think they are just the best! I haven’t tried it yet but definitely a must! Been there and done that with the a/c just two weeks ago… It was in the low to mid 90’s that weekend and very humid. Luckily, it was an easy fix, but it went out Friday evening and we had to wait til Monday, so I feel your pain. This skillet chocolate cake looks scrumptious, and I don’t even like Chocolate cake… BUT, I know that my husband and boys will, and I love to cook anything in cast iron. I love that you baked this in a cast iron skillet. OH EM GEE! This cake looks AMAZING! That big fat layer of chocolate frosting on top…. Om nom nom nom nom. I looooove some chocolate cake!! I am ALWAYS in need of chocolate cake! I got a cast iron skillet for Christmas and ever since it simply sits on my stove top because not a day goes by that I do not use it. However, I would’ve never thought in a million years to use it to bake a cake. This is genius and perfect because I have been craving chocolate cake. Thank you for sharing! can’t wait to try it but first, I have to get a cast iron skillet. Wow, I love this – can’t wait to try it! Just the right size too! Anything out of a cast-iron skillet is fabulous! I’ve done pie, but not cake. This one looks incredibly good! I decided this weekend that I am in desperate need of a cast iron skillet and you just made it a done deal. Simple, chocolately, PERFECT. There aren’t many things in life better than a dense chocolate cake!!! This looks so awesome! Yes, I need chocolate everyday! I can’t wait to try it! I just loved your skillet chocolate chip cookie. That was awesome! I LOVE dense cake! I’ve made more cakes in my cast iron skillet more than savory dishes! The frosting to cake ratio is pure perfection! I use my cast iron skillet for everything so why not a beautiful cake like this one! We always need cake, esp if it’s chocolate. 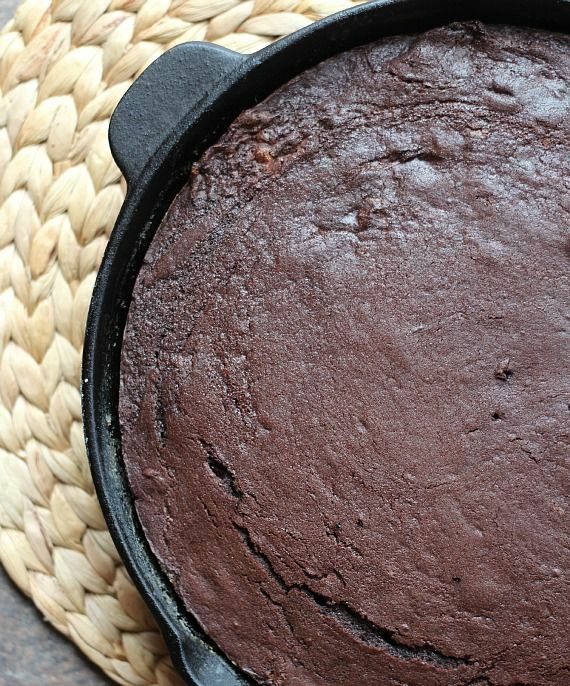 Chocolate cake can fix even the worst day and I love that you baked it in a skillet! This cake is absolutely lovely. I got a cast iron skillet as a wedding present. I’ll have to break it out for this. Chocolate cake is always necessary. I am baking a Guinness Chocolate Cake for dinner tomorrow night, just because. Your cake looks perfection!! This cake looks glorious! I love baking in my cast iron skillet! Woah, woah, WOAH. This is the stuff that dreams are made of. At least my dreams. I just LOVE baking in my skillet and this cake is a SERIOUS winner. That frosting?!? Ugh. I die. 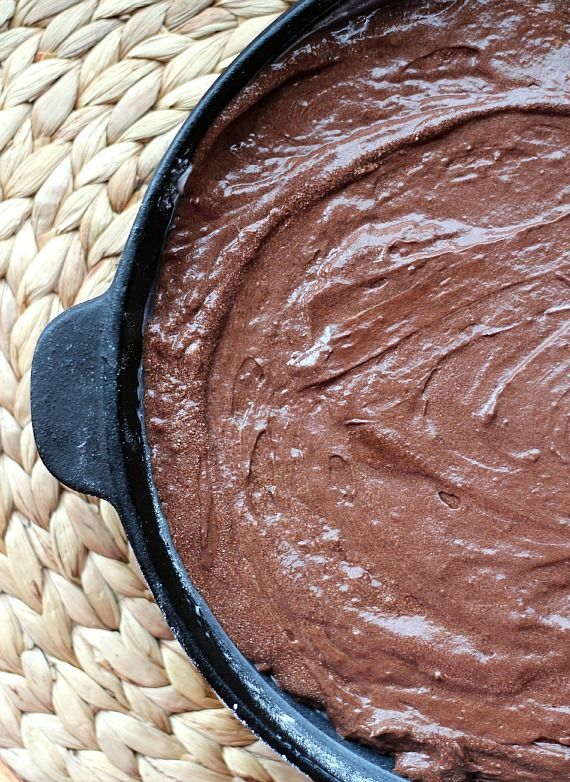 This cake looks amazing… Love the idea of baking it in a skillet! I love using cast iron for desserts and not just savory main dishes. Great recipe!